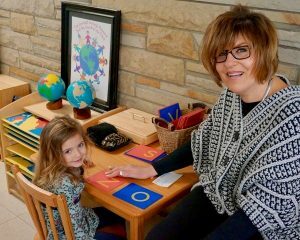 Montessori education is based on the premise that when you meet the needs of students in a prepared environment, children follow their natural impulse to learn (or “inner guide”) and thrive academically, socially, physically, and morally. As a scientist, Dr. Maria Montessori placed great emphasis on observation, calling upon teachers to observe children closely to determine their individual needs and pace of development. Montessori principles encourage children’s love of learning so they can reach their maximum potential at each stage of development. 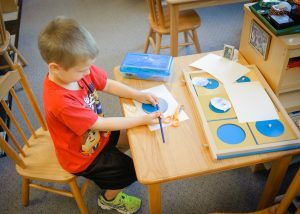 Montessori education fosters independence, critical thinking, problem-solving, and effective time management. Students learn to stay curious and take initiative, which often results in leadership skills and improved decision-making. They also learn to be responsible for the classroom materials and to cooperate with their peers in multi-age classrooms, which helps students develop trust in older children and feel responsible for those who are younger. Students learn not to fear failure, not to fear asking questions, and not to fear what mistakes can teach. They develop a healthy, lifelong, can-do attitude toward all kinds of learning, as graduates repeatedly confirm. Perhaps above all, Montessori students become comfortable with themselves and peaceful with others because they have been free to concentrate on work that interests them and has a purpose. (In fact, Montessori saw her educational philosophy as a road to greater peace in the world, and she was nominated for the Nobel Peace Prize three times.) Students develop faith in themselves, a global perspective, and an openness to their surroundings. They are self-disciplined because they have learned to trust themselves. They also learn to be self-motivated rather than rely on external motivators like grades or punishment. Montessori notes that her philosophy of education is less an external method of influence and more an internal liberation of students’ naturally developing minds and bodies. Great emphasis is placed on respecting each child’s dignity and observing—and meeting—each child’s needs. The result is an exciting atmosphere of self-discovery in a supportive community of active learners.